“What is modern hand appliqué?” we asked ourselves when we were auditioning designs for Quilts Made Modern. As I wrote when I was describing how we came to design the Small Change quilt, part of our mission in designing the quilts for this book was to break some of the stylistic assumptions quilters have about certain techniques. Handwork is not inherently old-fashioned in quilts any more than it is in couture fashion. Sometimes it’s the only way to achieve a certain look. Such is the case with Birds on a Wire. We love the graphic look of some traditional hand appliqué quilts and wanted to think about what a modern interpretation would be. And then what would it look like to mix hand and machine techniques? So we considered the view from our kitchen window of the birds that line up on the phone line that runs from our house to the electrical poles in our neighbors’ yard (we live in an urban neighborhood that was developed before electrical and phone lines could be buried). In the winter the birds queue up on the phone line taking turns at our bird feeders. We take great delight (as do our cats through the window) at the beautifully colored finches in particular. Although our daughter questions why the males get to be “the pretty ones.” “Do they appreciate being the pretty ones?” she wants to know. Anyway, there’s really no other way to place these birds with their delicate features on a quilt other than to hand appliqué them if you want the quilt to be washable. While I was hand quilting away on Small Change, Bill was doing the hand appliqué of these birds. The placement is not precise. It’s an eyeballing kind of thing. You can play around with how many birds you like with more or fewer working just fine. We really wanted to show the quilts as a diptych to suggest that you could make a series of these to work along a long wall or perhaps over a sofa. Although you could also make a wider version as well, given that this is hand appliqué, the smaller field is much easier to work with on your lap. You may notice that we’ve chosen to mix the handwork of the appliqué with machine quilting. We made that choice to make the quilting as dense as possible in the open areas of the quilt so there would be nice texture to the piece. Hand quilting would also work here but you’d need a lot of it. what? no knitting in public? I will freely admit that I was raised in a family that felt it was important to be well-mannered. Manners, I was told at a young age, are the grease that turns the wheels of polite society. Miss Manners’ columns in the paper were frequently read aloud so all would know the rulings on various socially awkward situations. While I’m not a formal person, I do think manners are a sign of respect toward others and I try my best to be polite to everyone from my husband to the mail carrier. In some ways this has hindered me socially because I take offense at behavior that other people find acceptable. Had I not been brainwashed about social graces, life would be easier for me and I wouldn’t get so grumpy at people who don’t RSVP for parties, for example. When only 6 out of 20 parents respond to a party invitation I get frustrated. Then there’s my favorite, “I think we’ll be able to make it…” to which I always want to respond, “then I might decide to cook enough food for you too.” Make a commitment. It’s two days away, I’ve got food to prepare–yes or no. I had to work hard to be polite to the mom who called to RSVP 15 minutes before the Easter Egg Hunt was to start. What’s with that? I envy people who can be easy-going about this. So I was really astonished to read in my favorite advice column “Ask Amy” written by Amy Dickinson that some people really take offense at people who knit in public. Wow, that was never on the very long list of social offenses that I was given. Chewing gum, smoking, wearing a hat indoors if you’re male, talking with your mouth full, I thought I knew them all, but KNITTING? A reader wrote to Amy about a woman who was at his weekend home. The guests and hosts were all sitting around chatting throughout the day. One guest had brought her knitting and was knitting while also participating in the conversation. The host found this really offensive and a sign that the guest was bored. In ensuing columns Amy has received lots of mail, mostly divided along gender lines, with men saying that they take offense if someone is knitting while they’re trying to talk. The female writers claim that the men don’t knit so they don’t realize that you can knit and pay attention to the conversation at the same time. This kind of reminded me of the conversation with a friend whose husband had installed a home theater system and wanted to watch a movie with the lights off. His wife, a mother of three, said to me, “Who watches a movie without folding laundry?” If I can’t knit when I’m visiting with friends, when would be the time to knit? Am I supposed to knit in private so no one takes offense? I can’t even count the number of people I must have offended over the years over this one. At most family gatherings that I remember at least one person was working on a needlepoint canvas or maybe knitting. Frequently there would be several people at once working on various projects. I think it’s lovely to watch people do handwork and see their progress over the course of the visit. And frankly there’s no way I’m not working on needlework if there’s a football game on the TV that everyone else is watching. So here’s where I wouldn’t knit: no knitting at religious services –no weddings, funerals or garden-variety worship services. I couldn’t believe it when on two different occasions I was teaching a quilting workshop and there were people knitting the whole time. There were things that they were supposed to be looking at and they were looking at their knitting. That seemed distracting to the other students too. I would never knit in a class of any sort or if there were a very serious conversation going on that required my undivided attention and eye contact. Any formal event, like a special dinner or cocktail party at someone’s house would be off-limits because I think I should be offering to help or mingle (a skill I will never, ever master). Friends in Japan teased me for doing needlework on the train, which I didn’t think was rude but was unconventional there. 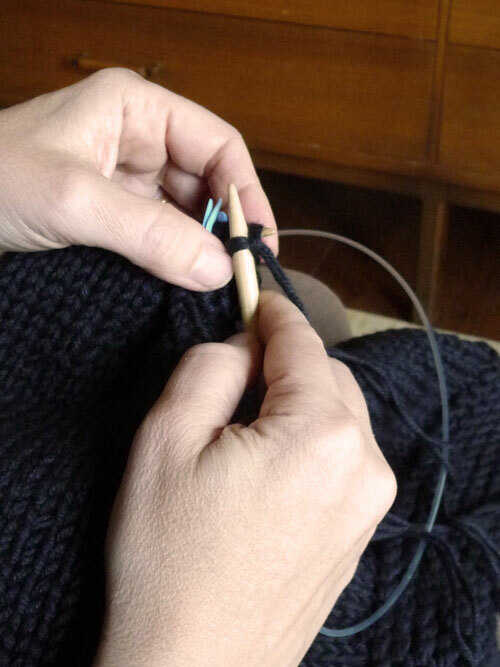 One knitting friend has the rule that you need two projects at a time to work on: one that is challenging and requires concentration like lacework or a complicated pattern that requires counting. Then she says that you also need a project that is brainless for when you’re chatting with a group and want to be able to look up and be a part of the conversation. So what’s your take? Where is it OK to knit or do any other type of handwork and which situations are inappropriate? And if there’s a man in your household, what’s his take? I can’t wait to read your responses.